Data Center Infrastructure Management is a broad concept. In general it refers to the systems and software tools used to track, tweak, report, or monitor everything in your data center, from airflow to current network traffic to UPS battery status. While some form of basic DCIM is necessary to run a data center successfully, more fully-fledged systems can appear prohibitively expensive. However, they provide tangible benefits and a single dashboard to monitor almost every component of your data center. DCIM represents the convergence of the facilities and IT teams. While primarily used within your facility for internal staff, certain pieces can also be made public to customers so they can monitor their infrastructure. The first DCIM software was often tweaked versions of existing Building Management Systems, which focus more on the facilities side (energy use, cooling, etc). DCIM tracks all components, allowing you to see how modifications to one system, like your air handlers, impact the others and the overall IT load. Improvements in efficiency can help you reach an ROI on DCIM much faster. DCIM helps find hot spots to keep IT equipment at an efficiently high but still safe temperature. PDU tracking enables capacity management with better insights into how much power will be used by what types of servers, networking equipment, and storage in different cabinet sizes and densities. Before choosing a platform, work with a team from facilities, IT, and management to find what they need. Appoint a DCIM lead who has experience with both sides of data center management. This discovery process should address efficiency, facility work flow, equipment management, capacity tracking and optimization. Do you have existing systems for network monitoring or cooling visualization? Some vendors can pull together your existing systems into one dashboard; others will replace them all together. Rank your priorities and start checking out demos or reaching out to sales reps at DCIM companies to see what kind of features are a must have for your implementation. 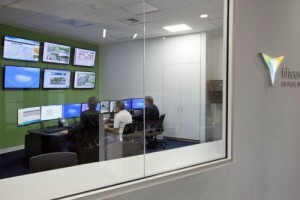 Most systems will include Power Usage Effectiveness (PUE) monitoring, with some adding Computational Fluid Dynamics to monitor the data center floor in regards to heat and airflow. Some might even have modeling abilities that can enter in hypothetical additions, allowing to facilities teams to scope out what might happen if they added another CRAC or rearranged some servers. Once you’ve found a solid platform that works with your existing systems and equipment, you may need additional sensors or other hardware in order to collect data. Your current Building Management Systems might be able to export information to the DCIM software. New metering for electrical consumption might be required. Be sure to carefully plan this implementation, as you might need to migrate customer loads or shut down various pieces of equipment. The hardware costs are simple to find out, but consider also the indirect costs of installing them (staff time) as well as any potential SLA impacts and the cost of downtime from the installation. Licensing costs are often based on a monthly, annual, or semiannual contract for the basic software, plus additional charges for certain number of items monitored (servers, generators, CRACs, UPSs, and so on). Implementing DCIM can be a large project, comparable to bringing your entire sales team onto a new Customer Relationship Monitoring (CRM). Don’t forget to consider training for your users as well as the impact of additional automation on their daily roles. Ultimately, even if DCIM doesn’t bring an ROI, it can result in smoother operations, improved capacity planning, and a value-add for colocation customers.